But although humans are enjoying the long awaited nice weather, dogs are really feeling the heat. With the rising temperatures, it can be increasingly difficult for dogs to cool themselves. Heat stroke occurs when a dog’s body temperature exceeds 103 degrees, and can cause a slew of health issues. Dogs that experience heat stroke will pant excessively, have irregular heartbeats, become dehydrated, and even go into shock. If you have your pup out on a hot day, be wary of excessive drooling, tarry, black stools, uncoordinated movements, and unresponsive behavior. If your dog lays down and becomes unresponsive to you, something is wrong and you need to take action. So what can you do? If your dog’s rise in body temperature can be linked to something environmental (say warm temperatures or excessive exercise), you can cool their body by either spraying them with cool (not cold) water, wrapping them in cool, wet towels or even immersing them completely in cool water. Try to avoid cold water, and gradually bring the dog’s temperature down. Any dog that has experienced heat stroke or an excessive rise in body temperatures should be brought to a vet to make sure the dog is in stable condition and that no long term damage was done. The sun is out, time to take a quick break by the creek! Step one: Know your dog. Dogs that have had heat stroke in the past will be more susceptible to it in the future. Dogs that are older, obese, or have thick coats are more prone to have an uncontrollable rise in body temperatures. Step two: Water your dog. Whether it’s making sure your dog has access to plenty of water at home, if you carry an extra bottle with you on walks, giving them a chance to drink from the dish in front of Starbucks, or stopping off to give them a swim in the lake, just make sure your dog has a chance to drink and cool off. I even give Pickle an ice cube every now and then for her to lick and chew on, just to keep her cool (and entertained!). I have a friend who gives her boxer chilled watermelon, and she goes crazy for it! A good swim in the lake will help a dog stay nice and cool! Step three: Be aware. Know the signs of heat stroke. Get certified in doggie CPR. Be conscious of your environment and where you leave your dog. And for cripes sake, don’t leave your dog in a parked car when it’s hot out! Heat stroke can occur even when the temperature outside the car is 70 degrees. So don’t do it, not even for a few minutes! Don’t believe me, check this out! So here’s the deal. While you’re out sunbathing and working on your summer tan, your dog may be having a really tough time in the sun. 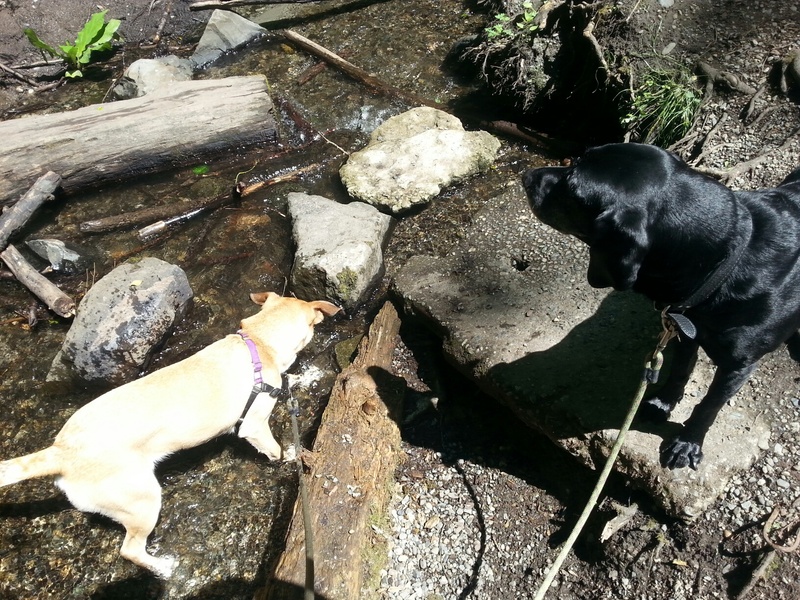 It is up to us as owners to be responsible and provide our dogs with whatever they need to beat the heat, whether it be a constant supply of water, a romp in the creek, or a trip to the groomers. Don’t assume your dog will be okay, and it will be a happy and safe summer for all!